When you are running an online store, your online reputation is really important not only for SEO purposes, but also for organic traffic too. If the only online presence you have is your ecommerce store, it is likely that you are missing out on large opportunities with social media and organic traffic. Just like any business, your online store is going to take some work to make it successful. Use Google+ to improve your site’s SEO. Here are 5 tips for becoming successful with Google+. The first step is really quite obvious. If you don’t have a Google+ account, how can you be successful with it? You must have a Google Email account to create a Google+ account. You can use your personal account or create a business email account to manage your business Google+ page. You can also assign administrators of your page so you don’t have to worry about sharing your password. Once you have a personal Google+ page, you will need to create a business page for you company. You can’t have a business page without a personal page. After you’ve created the account, be sure to take the time to fully fill out all your information. Don’t miss this opportunity to share information about your company with your potential customers. You want to be sure you create a profile pic and cover photo. Do some testing with your photos and see what looks good in the above dimensions. The more +1’s you have on your account, the more Google and others are going to think your page is relevant. 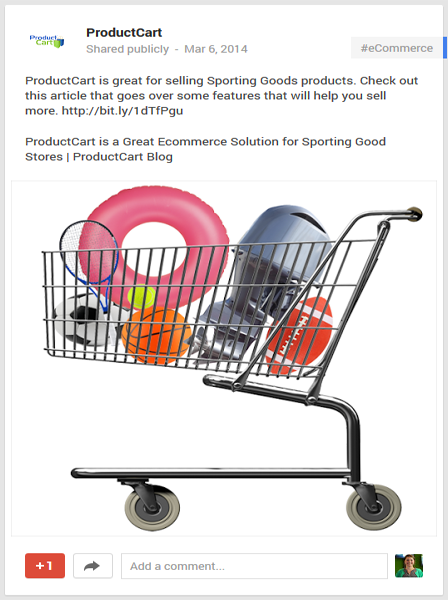 Be sure to link your ecommerce store with your Google+ page to encourage your customers to +1 your account. You also want to link your account with other social media platforms that your company is using. The more synced your accounts are, the greater chance you have at building followers. You don’t want to have a blank Google+ page. You want to produce content that your customers and prospect customers will find useful and beneficial. Your company’s blog articles make great content for Google+. It is okay to share other company blogs, but remember this is an opportunity to build credibility and send visitors to your site. Add keywords and add hash tags to have your post show up in search results. Treat these keywords the same way you would for SEO purposes. Think about what your customers are going to be searching for. Just like other platforms, Google+ goes through changes that can be as little as updated layout, or as big as the way you share information. Make sure that you stay updated on Google+. I recommend following the official Google+ account to stay informed of any major changes. You don’t want to be doing something that could potentially harm your organic search ranking. Sometimes platforms can add new information to your profile, such as the ability to link to your YouTube account. Be on the lookout for these changes and add the appropriate information when necessary. Google+ is just one of the social media platforms that can help your business sell more. If you need help with a strategy for Google+ or setting up any of the items described on this list, contact us at 1.800.709.3240. Please provide any tips or suggestions for Google+ in the comments section.